I buy pastured eggs for their rich yellow yolks and firm shells, but if you’re anything like me, you might also wonder how much of the package promises are true and how much is exaggeration. 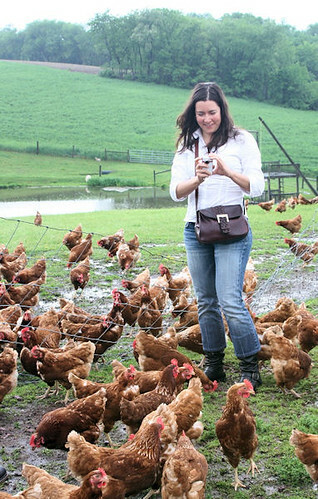 I was thrilled to have the opportunity to travel with a small FreshDirect team to visit Westfield Egg Farms, the producers of Nature’s Yoke eggs. After meeting the team and seeing their packing plant, farms and happy hens, I left Lancaster County, PA, with great photos and a genuine trust in the quality, care and good process behind every egg. We started with staff introductions and a tour of the packing facility. The team at Westfield has been in the conventional egg business for generations, but when George Weaver III took over the operation, he added a line of eggs from cage-free chickens. George realized that he also wanted to make use of his community’s rich, green fields and traditional farming families to produce a special, old-fashioned line of eggs from pastured chickens. Last year, the timing was finally right: urban families were asking for eggs from pasture-raised chickens, and George knew just where to find those hens. Some of his Amish neighbors were already caring for hens in open barns (and others had expressed interest), so George set up processes for a group of these small-scale family farms and organized end-to-end quality control and labeling practices to get these farm products ready for wider distribution. After a few months of work and coordination, the Nature’s Yoke line of pastured eggs was ready to roll. All the eggs that arrive at Westfield are specifically tagged and labeled by farm before they’re cleaned, inspected, graded and packed. For George, that means that tracking down where and when a dozen Nature’s Yoke eggs started is as simple as interpreting the code that’s ultimately printed on the side of the carton. After a delicious farmhouse lunch in the home of one of George’s Amish neighbors, our team traveled to three open-air egg farms along the Pennsylvania farmland. Though the families requested that we avoid photographing them, we did get plenty of images of the hens. In the nicer months, the chickens that supply Nature’s Yoke pastured eggs wander as they wish between the barns and the rolling hillsides. The hens have plenty of grain and water if they want it, but they also typically spend time scratching the ground and nibbling the grass. George said that in the cold months, these chickens stay in the barns, but they get piles of hay to scratch and pick through. It was a pleasure to tour the beautiful Pennsylvania countryside, meet the farming families that supply Nature’s Yoke and learn all about the egg packing processes from George and the Westfield staff. For a local food fanatic like me, there’s nothing like knowing the stories behind the packaging and the chickens behind the eggs. Do you like to see where your food comes from? Are you interested in the stories behind the food? Let us know at our Facebook Wall or on Twitter (@FreshDirect). You can also click here to see more pictures from the trip at Facebook.